PHOENIX (August 22, 2018) – A new poll from OH Predictive Insights shows that the GOP primary for Arizona Corporation Commission is largely wide-open. Surprisingly, Democrat-turned-Republican Rodney Glassman has a slight edge over his fellow Republicans. 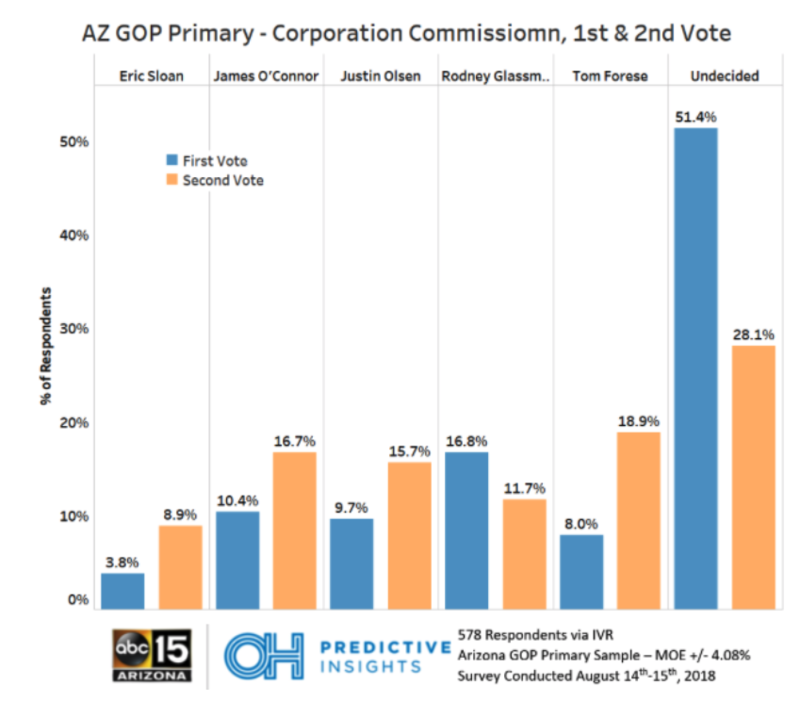 OH Predictive Insights and ABC15 Arizona (OHPI/ABC15) teamed up to find out the current state of the race for the Republican primary for Arizona Corporation Commission. 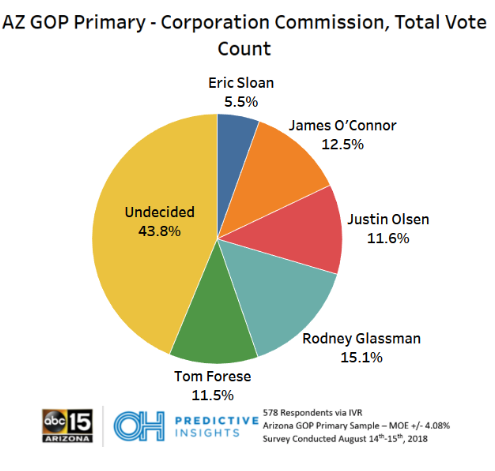 Glassman (15.1%) holds a slight advantage although O’Connor (12.5%), Olsen (11.6%) and Forese (11.5%) are well within striking distance. Compared to the rest of the field, Sloan (5.5%) has more of an uphill battle. With so many voters undecided in the contest, it’s hard to predict who will finish in the top two. The chart above is the first vote versus the second vote breakout. If respondents were undecided on the first vote, they branched to the next question. However, if they had a first choice they were asked for their second choice with an option to choose undecided. Methodology: This IVR telephone survey was completed by OH Predictive Insights in partnership with ABC15-Phoenix (OHPI/ABC15) on August 14 and 15, 2018, from a likely Arizona 2018 Republican Primary voter sample. The sample demographics accurately reflected party affiliation, geographic location, gender, and age. 89.3% of respondents were Republican and 10.7% were Independent voters. 100% of respondents were completed via landline. The sample size was 578 completed surveys, with a MoE of ±4.08%.